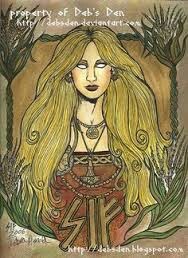 Sif is a Norse/Scandinavian Grain Goddess, associated with the Earth and its’ vegetation. One species of moss is named after Her, “haddr sifjar” or “Sif’s hair”, which is great praise, as her golden mane of hair was Her most striking feature. Her name possibly means “relation by marriage” which would be descriptive to Her role in Asgard. Sif was a swan-maiden, similar to the Valkyries, in that she was able to take the form of a swan. She is a Prophetess, as well as the Goddess of wheat, fertility and family. Some say She is also a Goddess of fidelity, but that title is debatable, as you will see later. Her first husband was the Giant Orvandil, whom whom She had a son, Ullr the Magnificent, God of Winter. Sif, then married Thor, the Great God of Thunder, which whom She had a daughter, Thrudr, Goddess of Storms and Clouds, and two sons, Magni (Might) and Modi (Brave). Sif and Thor were happy for a time and loved to make love in the fields during the summer, the thunder from Thor and the lightning from Sif, could be seen for long distances on these occasions. With Thor being a Sky God and Sif being an Earth Goddess, this follows the path of many myths and legends whereupon their consummation symbolically gives life to the Earth. Her symbols are the sun, gold, Her hair. She is connected to the Rowan tree. The protective tree with its berries of sacred red. The tree that is called Thor’s salvation. Let it save you too. Sif’s hair was long, golden and beautiful. Once Loki, the Trickster, came and stole her hair. Thor was incensed. He forced Loki into the realm of the Dwarves. Their best craftsmen made Her new hair of spun gold which, when attached to Sif’s head, would grow as if it were Her own. It is believed that Her golden hair is a metaphor for the golden grain, with which She is connected. 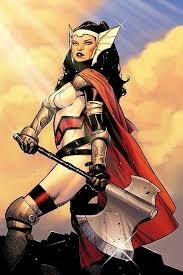 More than one of the gods told Thor that Sif had a lover, which angered him and lends some doubt to Her being a Goddess of fideltity. Some would say that Her lover was Loki himself. In Stanzas 53 and 54 (below) of the Lokasenna, one of the poems of in Poetic Edda, a collection of old Norse poems. that I alone am blameless. Bringing Sif into modern times, a moon on Venus was named, “Sif Mons” after Her. Probably most significant are the changes to Her within the Marvel Universe. She is sister to Heimdall, the Watchman of Asgard. In their telling, the Dwarves that spun her golden hair became Trolls. As Loki stole the hair without paying for it, the Trolls had not been able to bespell it, and so, over time, Her golden hair turned to ebony. 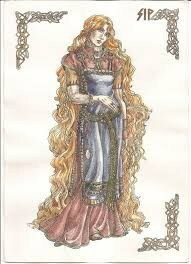 As Sif was very vain about Her hair, Her parents sent her away to learn the ways of the Shield-Maiden. 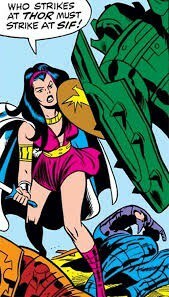 When Sif returned to Asgard, she was a highly skilled Warrior. She has a sword charmed by Odin that will forge pathways between dimensions, mostly between Asgard and Earth. Her fighting ability is only surpassed by the Valkyrie Brunnhilde. Odin chooses Sif to be wife to his son, Thor, as he recalled that they were childhood friends with strong feelings toward each other. They were happy together until the time that Thor preferred the mortal realm, while Sif preferred the immortal realm. They are still together, but marriage has been delayed. What the future will hold for them is unknown.